Elaine happens to be my cousin—maybe second or third removed. I think she was a second cousin of my mother and was installed into the Cowgirl Hall of Fame in 2005. I was thrilled to find her photo prominently displayed. The museum was not very big with a large part of the bottom floor taken up by an immense gift shop with every sort of bling you can imagine a cowgirl might want. A Carved wooden wagon displayed the names of the donors=–all in bas relief—a nice change from the usual plaques on the wall. The first floor gallery included a large display dedicated to Sandra Day O’Connor, retired Supreme Court Judge from Arizona. She grew up on the Lazy B Ranch situated on the state line between New Mexico and Arizona. Of course, she did all the ranch type things including riding horses. Her Supreme Court robe was on display—like LadyBird Johnson, she was not a large person.. 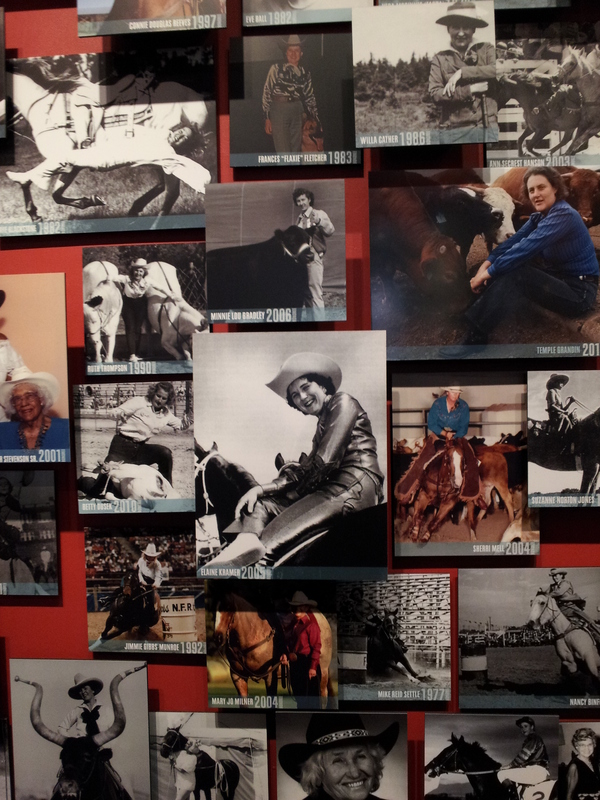 The upper floor had a large wall with photos of the cowgirl honorees. A theatre showed a short movie about the history of cowgirls in the movies introduced by a talking horse head. Display items included several saddles—one ridden by Dale Evans, the outfits she and Roy wore at the 1970 Houston Rodeo Show, fancy boots and hats and bandannas. Most of the early cowgirls made all their own costumes and took care to wear their finest during the shows. Some of the trick riding these girls did was amazing—including my cousin who would ride 17 horses at one time. By the time she was inducted into the hall of fame she was no longer riding anything more exciting than the back of a pickup truck in the annual Fourth of July Parade. Cowgirls competed in bronc-busting and calf roping and so forth—with no easy rides given to them. Considering that they grew up on ranches where everyone had to pitch in, it is not surprising that they were tough ladies. This entry has been one of perseverance as it seems wordpress was having difficulties; my internet connection was challenged–and so I’ve been trying for the past week to upload this—but now we can all move on and I’m sure all of you are relieved to discover exactly who Elaine is. And there is a reference to Marin on Robert Genn’s Painters Keys today. If you haven’t figured out how to load elaines photo from your camera, this is what I do. I send it to myself in an email. then when I get it I save it (and name it) in my pictures. I then can post it on the internet of send it one to friends. Disregard my comment about photo as I see you did accomplish it!